Data from moving companies reflect continued mass exodus from Illinois. 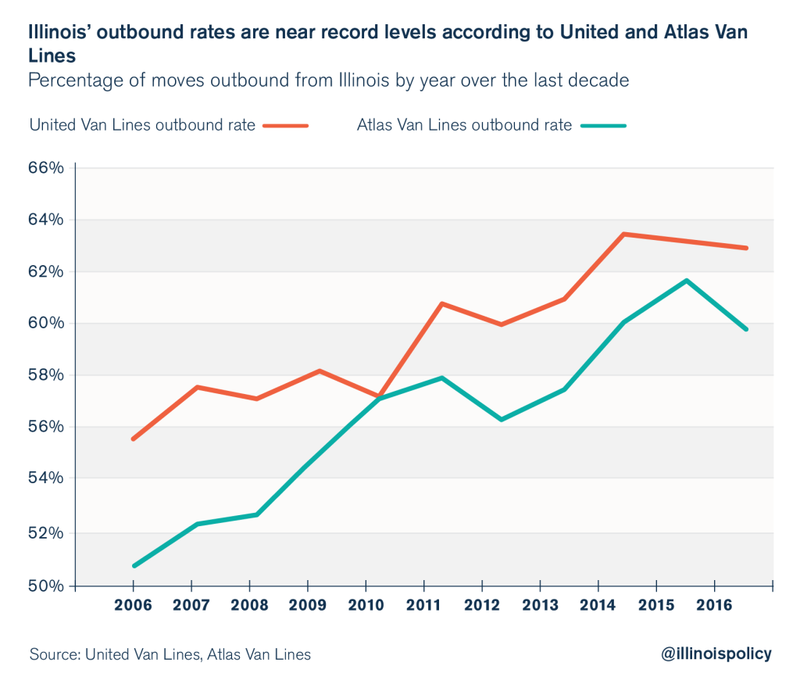 Illinois’ surging debts, rising property taxes, weak job creation and political dysfunction continue to be a boon to large moving companies United Van Lines and Atlas Van Lines. United and Atlas offer large shipment moves across the country for households and businesses. According to 2016 shipment data released by the two moving companies, Illinois has the worst “outbound” rate for total shipments in the entire country. Using a combination of United and Atlas’ data, 62 percent of all shipments that touched Illinois were outbound, while only 38 percent were inbound. New York was the only other state with more than 60 percent of combined shipments being outbound. One of the staggering facts about the data is not just that Illinois’ outbound rate is the worst in the country, but also that the total shipment count out of Illinois is almost identical to New York, even though New York is a significantly larger state. New York has 7 million more people than Illinois, making the Empire State more than 50 percent larger than the Land of Lincoln. Nevertheless, total shipments in and out of New York and Illinois were nearly identical. Illinois had 9,270 outbound shipments and 5,902 inbound shipments, for a deficit of 3,368 shipments. New York had 8,818 outbound shipments and 5,477 inbound shipments, for a deficit of 3,341 shipments. Illinois’ outbound rates measured by both companies have been surging over the past decade, and have hit their highest rates ever for the past three years. The moving company data reflects the increasing rate of people leaving Illinois and the changing financial character of people leaving Illinois. According to Census migration data, from July 2015 – July 2016 Illinois lost a record 114,000 people in net migration to other states, causing the total state population to contract by 37,500 people. The rate of people fleeing Illinois has been at all-time highs for the past three years of data, resulting in a total state population contracting for three consecutive years. The sheer magnitude of outflow should trouble policymakers in Illinois, as Illinois’ loss rate is multiples of surrounding states even after adjusting for population size, and Illinois is the only shrinking state in the Midwest. Another troubling sign is the increasing flight of wealth and earning power associated with those moving out of Illinois. 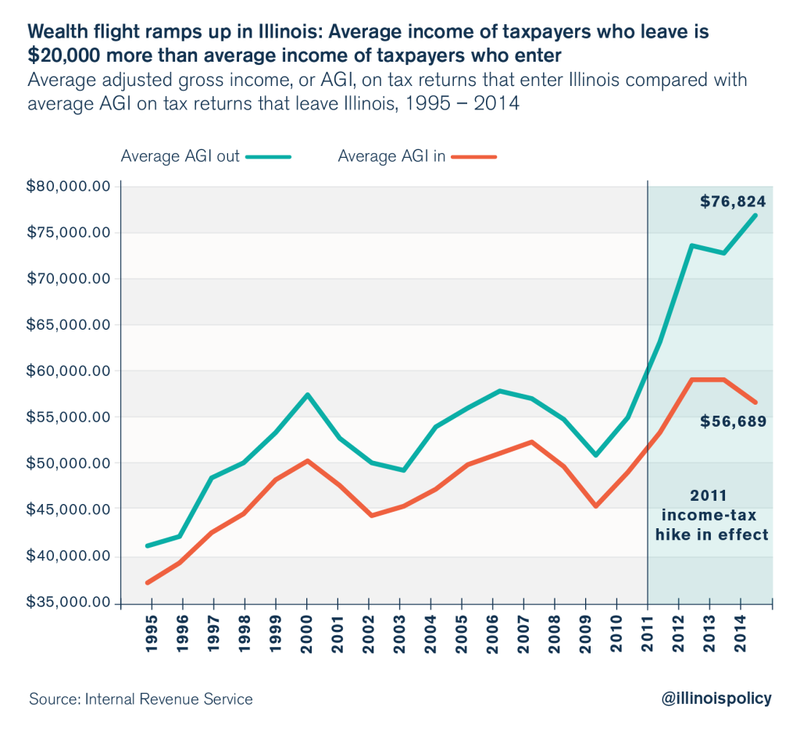 Migration data from the Internal Revenue Service, or IRS, show that as of tax year 2014, the average income of taxpayers leaving Illinois was $77,000 per year compared to an average income of $57,000 per year for those moving into Illinois. This $20,000 differential between the average earnings of those moving out compared to those moving in is the worst in Illinois history and the worst in the country. IRS wealth flight data corroborates the Atlas and United shipment data. The moving companies ship significant property and assets between states for households and businesses. Wealthier Illinoisans and business owners are more likely to use United and Atlas’ services while a smaller alternative such as U-Haul can be used for those with less wealth. As it is, U-Haul rental rates also reflect the movement of U-Haul trucks out of Illinois. Illinoisans of all income levels are fleeing as Illinois teeters toward becoming a failed state. Those who stay watch their property taxes and public debts skyrocket as job opportunities dwindle, giving more people incentive to leave. The state legislature seems uninterested in addressing any of these problems but is very keen on another income tax hike – the very same “fix” that led to income earning power pouring out of the state after the 2011 income tax hikes. The only solution to avoid a financial disaster is transformational change in how Illinois taxes, spends and regulates businesses. Spending needs to be slashed to come in line with what taxpayers can afford, which requires changing collective bargaining for government unions and addressing state and local pension debts. Other spending drivers, such as Medicaid spending, should also be reformed. Taxes need to be brought under control, especially skyrocketing property taxes driving people out of their homes. And the growth side of economic policy is critical too. Reforms need to be made so it’s easier for businesses to invest and create jobs in Illinois. Without business investment, job creation and productivity growth will not happen in Illinois. The new year brings a new opportunity to right the mistakes of the past. The question now lies with the state legislature on whether to fix the state or continue to watch it sink.